Now and then, I get e-mail inquiries about Brazilian Embroidery – either from newcomers who are looking for learning resources for Brazilian Embroidery or from stitchers looking for supplies. I was glad to receive an e-mail not long ago from Pat Kamperschroer, who is the newsletter editor for the Brazilian Dimensional Embroidery International Guild (BDEIG). Pat noted that I don’t have Brazilian Embroidery listed under the “Types of Hand Embroidery” section on the website. I suppose it was kind of cheeky of me, but I hinted (or maybe I asked outright!) that if I had some good photos of some Brazilian Embroidery, I could build a permanent page with resources. The last time I did Brazilian Embroidery was about 18 years ago, so I don’t have anything of my own to build a page around. Pat very kindly sent my reply on to some of the others involved in the BDEIG, and thanks to Loretta Holzberger, the treasurer, I now have some samples of Brazilian Embroidery to use to build a permanent page under “Types of Hand Embroidery,” and link it up to some good resources. Thank you, Pat and Loretta! Today, I’d like to show off some photos of Loretta’s Brazilian Embroidery and talk a little bit about this type of embroidery. And then later in the week, I’ll build that permanent page and do some linking up! All of the photos here are from Loretta Holzberger and represent her work. Loretta does some amazing dimensional embroidery. 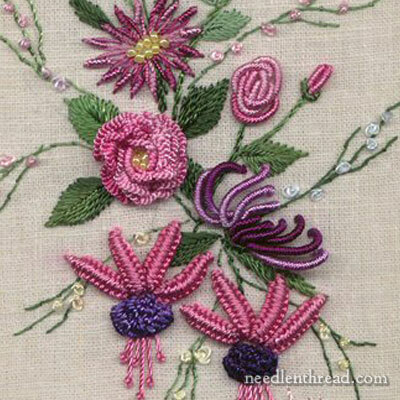 She has a website called Dimensional Embroidery, where she sells designs and kits for Brazilian Embroidery, so most of these pieces featured here, you’ll find in kit form on her site. Now, what is it that makes Brazilian Embroidery different from surface embroidery or even stumpwork? It’s obvious that it’s a very dimensional embroidery, for makes use of woven picots, lots of French knots, bullion stitches, cast on stitch, drizzle stitch, and so forth. 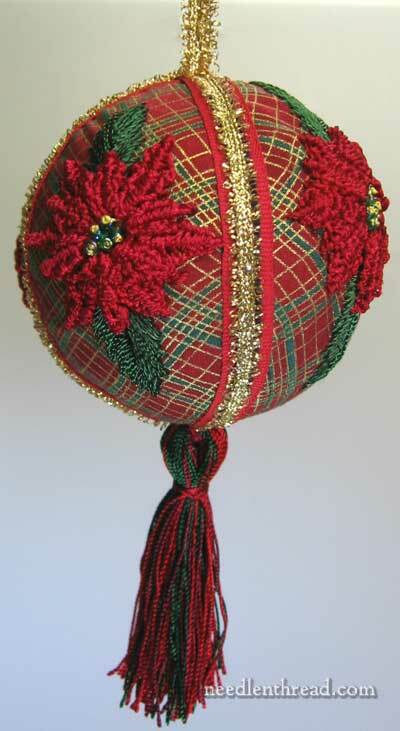 Unlike stumpwork, which is also dimensional, Brazilian Embroidery doesn’t rely on the use of wires for supports of various parts of the design (which is typically done in stumpwork for flowers and leaves), and you don’t see padded areas or covered foundations (like wooden beads). Brazilian Embroider relies on the stitches alone and the build up and layering of the design to create its dimensional effect. 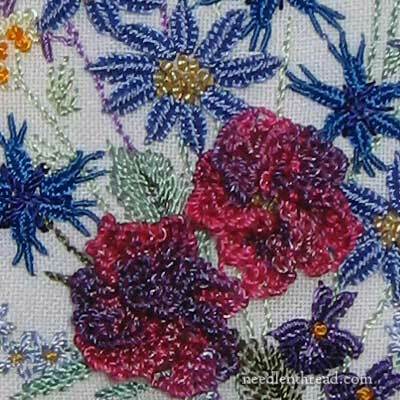 You can see in this piece that Loretta got inventive with the background and worked the Brazilian Embroidery design on a piece of drawn and pulled thread, which is probably mounted on another background fabric that’s tightly woven. I love seeing combinations of different techniques in a piece like this! Typically, BE is stitched on a tightly woven ground fabric that supports the stitching. Trigger cloth, or blazer poplin, is one of the more common fabrics used for BE, but in fact, the technique can be worked on any ground fabric that has a close weave. 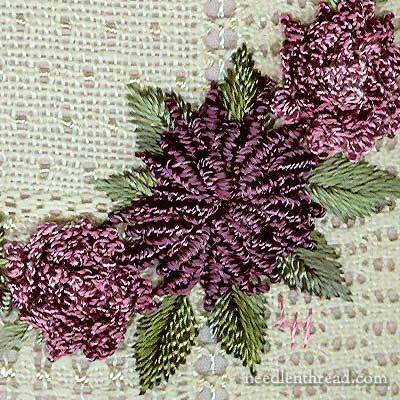 Another noticeable difference between specifically Brazilian Embroidery and other dimensional and surface embroidery techniques is that Brazilian Embroidery always features flowers and foliage as its subject matter, and nothing else. You don’t see, for example, people embroidered in BE techniques – or animals, or inanimate objects, and so forth. You see foliage and flowers. But that doesn’t mean that Brazilian Embroidery is relegated to the framable-picture-for-the-wall or the top of a sofa cushion. 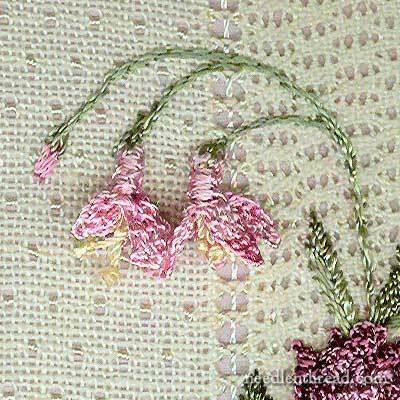 No – it can be used to embellish anything that wants embroidery for embellishment. What really sets Brazilian Embroidery aside from other techniques, though, is that it uses one type of thread exclusively. You know how, in surface embroidery, you might use wool and silk and cotton – and maybe all in the same piece? 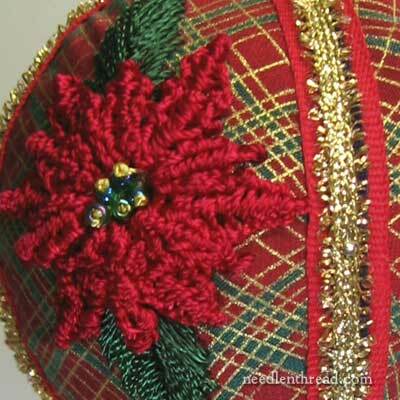 Or you might use silk and metal threads… or in stumpwork, you might combine wool and silk and metal threads? That doesn’t normally happen in Brazilian Embroidery. The “signature look” of Brazilian Embroidery comes from the thread that is used, which is made from rayon. Brazilian Embroider threads have a very high sheen and are z-twisted. The most popular Brazilian Embroidery thread is by Ed-Mar, which supplies seven different weights (thicknesses) of the rayon thread to work with. For more information on Brazilian Embroidery, I’d especially like to point you to the Brazilian Dimensional Embroidery International Guild, where you can find all kinds of information, instructions, and even free projects. 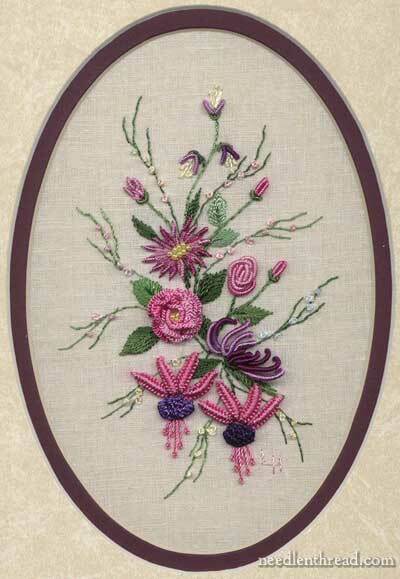 If you’re looking for designs or kits, feel free to visit Loretta’s Custom Stitchery. 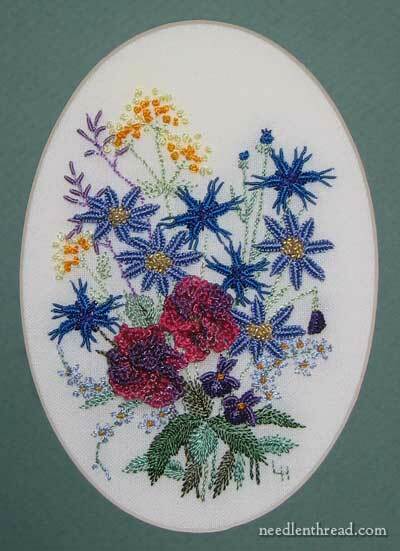 Incidentally, and worth mentioning, Loretta also has a selection of stumpwork flower designs on her site, and some needlelace designs. Her kits include screen printed designs on the ground fabric and all the instructions and specialty items required for the work, but not the threads. There’s a list of required threads in the instructional packet. This helps make the kits affordable, especially for those who already have threads in their stash. For threads and other little necessities and accessories – including needles (milliners are used a lot in Brazilian Embroidery, thanks to all those bullion knots!) – I recommend Threads in Bloom. Sharon provides friendly and knowledgeable customer service, along with all the supplies and some kits for Brazilian Embroidery. So what about you? Are you a Brazilian Embroidery enthusiast? Why or why not? What do you like about it? What don’t you like about it? What are your favorite resources? Have you tried the technique, or is it something on your list to try? Let us know your thoughts! Feel free to leave a comment a below! That is SO COOL!!!! Mary you find the absolutely most awesome stuff I never knew existed. I HAVE to try one of her kits. You are like the cultural ambassador of embroidery. LOVE IT and LOVE getting Needle n Thread every day!! Woohoo!! I just ordered two of her stumpwork kits and two of the brazilian. THey are VERY reasonably priced too!! Look like fun little projects. I’m HAPPY!! Mary, I fell in love with Brazilian Embroidery over a year ago, but the Brazilian Embroidery I saw was very fine and delicate. I don’t know if it has another name or is another class of Brazilian Embroidery, but I am sure you have seen it (since you know more about the art of embroidery than anyone I have ever heard of) and I know everyone who reads & keeps all of your columns would love to see it. I would love to see more of it myself. Please. I was waiting for You to write about Brazillian embroidery since the discussion mentioning your name in yahoo groups of BDEIG online chapter. Thanks a lot for all the information. I have done few BE stitches and posted in my blog. I love Brazilian also – Edmar’s Verana is one of the projects I’m currently working on. I have only recently discovered and fell in love with dimensional embroidery, having seen stumpwork embroidery discussed here. I’ve only done surface embroidery, since that is what my mother taught me. I just don’t know where to start, especially now that I’ve seen Brazilian embroidery. Thank you for introducing me to Brazilian embroidery. I’m sure I’m not the only one of your followers who is amazed at these incredible dimensional stitches. I have a nifty collection of EdMar threads. Love the feel and look of them. But I don’t really know how to use them. 🙂 Wish I was brave enough to try Brazilian embroidery. It’s so beautiful. I like using many of the stitches in my crazy quilting. Cast on stitches are probably my favorite, and I also use a lot of bullion knots. The rayon threads are the easiest, but with patience I’ve used many other kinds of threads too. With crazy quilting, Brazilian Embroidery is a nice addition to the repertoire. I LOVE Brazilian Embroidery. I’ve been doing it for years, and I’m the only one I know of in my area that does more than dabble in it. Two of my favorite resources for BE are JDR Brazilian Elegance (http://www.jdr-be.com/) and Christine Hause (http://www.christinehause.com/). Both provide excellent service and are very helpful when answering questions. The Nordic Needle (http://www.nordicneedle.com/) also has an excellent supply of BE supplies, but the other two are almost exclusively BE and their selection is larger. One of the reasons I like it is that it is very forgiving. It’s not like needlepoint or counted cross stitch where everything must be in the right place. Some variations are expected. It’s a lot of fun. I even really enjoy working with the rayon thread. What beautiful work, and those theads have a ownderful feel on my hands. I learned to do this many years ago, I should try to practise and see what I can remember, Thanks for all the beautirul work you share. 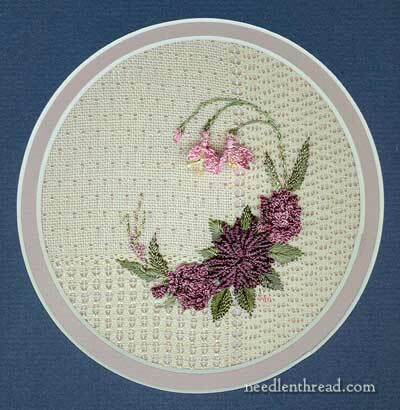 I read about Brazilian embroidery here on your site some time ago and jumped on ordering a kit from Sharon at Threads in Bloom. I really enjoy Brazilian embroidery and I like the sheen of the threads. The kits are small and simple enough for one to finish in a short period of time. I look forward to seeing more info and pictures on this kind of embroidery. Thanks a bunch Mary. Mary, last year I had some surface embroidery classes and I really felt in love with it. Besides I live in Brazil, I’ve never had the opportunity to learn Brazilian Embroidery. I have some home ware pieces embroided in BE from the 70’s, when I got married. I think the intensive use of flowers and foliage may be a reference to our exuberant nature. Congrats for the blog. Its sooo wonderful u have put your mind into developing a BE for us….It was just last week I was searching ur site over and over again for a tutorial of BE but only found the introduction sort of and i was just hoping in my heart u would start…its like my prayer answered…. And thanks to Lakshmi Sadala ‘s comment for giving an alternative for the rayon thread …. Looking forward to ur expansion!!!!!! Hi, Mary! I was so happy to see you discussing Brazilian Dimensional Embroidery on your blog. I enjoy many types of needlework, but I’ve really fallen in love with BDE. I love the sheen of the threads and the beauty of the dimensional flowers you can produce. I have to disagree with you about the subject matter that is produced by BDE stitchers, though. I’ve seen many other things stiched besides flowers and folage. I’ve seen fantastic birds, animals, seashells, hourglasses, as well as beautiful landscapes & underwater scenes stitched. I have never considered anything subject off limits,actually. I, also, use many of the techniques that I’ve learned in BDE in my crazy quilting, too. If any of your online readers don’t have access to a local BDEIG chapter and want to find out more about BDE, I encourage them to come check out our BDEIG_Online_Chapter on Yahoo Groups. There are lots of talented people there to answer their questions. In fact…come join us yourself! We link to your blog often. I was so pleased to see today’s post on Brazilian embroidery. We have just begun a round robin on Crazy Quilting International (CQI) with five ladies all embroidering seams and motifs in brazilian embroidery on crazy quilted blocks. Thanks for the links, they will be very useful. OMGosh Mary! Loretta’s handwork is absolutely gorgeous! Before seeing these in the newsletter today, I didn’t know what Brazilian Embroidery was…thank you for the info. & pics! I like the look of BE but am really too chicken to try it for myself although when I think about it, I do lots of the stitches in my usual freestyle embroidery. Maybe later in the year. I think it looks beautiful and I don’t think I could learn how either.BE looks hard to do. But thank you for letting me see some. I learned how to do Brazilian Embroidery in the early 80’s when I lived in a small town in southern Alberta. After I moved away from there, II have not been able to find the necessary threads. Thanks for all the links so I can take this up again! I can’t believe how timely your comment is. Just yesterday I heard of Brazilian embroidery, did a search, and printed off how to do the basic stitches. Can’t wait to read more about it. thank you. I’ve recently started taking a class on Brazilian Dimensional Embroidery and am addicted. My friend introduced me to a knowledgeable and patient instructor in Vancouver, WA. I’m so glad to see the links and the inclusion of some information on BE. Is your instructor’s name Jinks? I never knew about this type of embroidery. It is so beautiful. I discovered Brazilian embroidery about 3-4 years ago. Not knowing any better, I bought an advanced book and started stitching. I am totally hooked. I am even teaching it now. I have even designed a few items. You can see a couple of them on the BDEIG website under member gallery. Brazilian embroidery is technically demanding but well worth it and the threads are just gorgeous. Check out BDEIG’s annual seminar too. I’m so glad you are sharing Brazilian embroidery with your wonderful blog/website. Many of us who do B.E. are big fans of your informative newsletter. Let me know if you’d like more pictures to post. I’ve been designing and writing books about Brazilian embroidery for a while now and will be happy to send photos. If you have a chance, I invite you to visit my new blog: http://www.RosalieWakefield-Millefiori.blogspot.com. This is such a wonderful artform and you are reaching a lot of stitchers. Thank you. Just this morning I went looking on your site…so I could see a great example of how to “properly” do a cast-on stitch…so it did not twist but laid nice and flat. I was so sorry to find you did not have a video on that! So, add that stitch to you list of to-do’s please. Thanks! Thanks for the note and “reminder” – I need to get hauling on editing videos. I actually have a cast-on video filmed. Just not edited. And I might have to re-film it, as I’ve improved a few things in the filming method lately. Incidentally, if you combine the way a bullion stitch starts and ends with the drizzle stitch and the way the stitches are cast onto the needle, you’ll have the cast-on stitch! 🙂 Maybe that can tide you over until I get around to the videos again. Uh…. some day…. sort of soonish…..
Have just read your “Z” & “S” thread – makes a difference too with bullions. I am from Sth Australia home of Country Bumpkin in which Susan O’Connor wrote on this. Yet my reply is about Delma Moore of http://www.blackberrylane.com.au who is a wonder at this style often combining it with surface or stumpwork. She will be teaching in Brisbane at http://www.koalaconventions.com.au in July. I love reading & seeing your work develop. And like today looking at blanket stitch one of my favourite relaxing stitches. Sending you some warmth and sunshine from Australia & looking forward to learning even more about this wonderful embroidery world. I am a Brazilian embroidery lover. I learned to do it some 20 years ago and just recently discovered my stash of Edmar threads. Gonna get back into it real soon! I just took a class in silk ribbon embroidery. I wasn’t to sure if I was going to like and during the class the instructor added some Brazilian embroidery to the design and that it was it… I am hooked! I am thrilled what is produced on the tutorials. Thank you so much! Seus bordados todos são lindos. Parabéns. Embroidery is my passion!I just love the beautiful embroidery works that is on your website.Mary,can you put up some beautiful patterns for the embroidery on your website or do you have a good embroidery pattern book,which i can just have it from you as a new year’s free gift?I love the threads that you use.Thank you and once again keep up the good work!!! What amazing eye candy!! I’ve never heard of it before- simply yummy. What do you think of doing a Mille Fiori alphabet letter in the technique?! Would it work? What adjustments would be needed? I really enjoy your website. I am new at Brazilian embroidery. Hi Mary, thank you for making all your wonderful videos I’ve learned a lot from them. I am so glad that you are talking about Brazilian Embroidery. I love it and have been doing it for over 20 years. I use it on clothes, cards, bags, tote bags, Crazy Quilts, and baby blankets. Usually I make up my own designs. When I want to embroider on something that needs to be washed I use DMC’s Pearl Cotton number 8 and for my cards their regular floss. The flowers don’t have the same sheen as the Brazilian floss but they still turn out beautiful. I would love to see some Brazilian Embroidery videos someday. Especially some of the more Advanced stitches. I took a class in Brazilian embroidery and really enjoyed it. Then I learned from my instructor that the threads are not colorfast! I needed to wet it to stretch and mount it and she gave me all these complicated instructions on how to minimize bleeding, but basically some bleeding was unavoidable. All that work for something that might well be ruined. I loved some of the stitches, but will never use that thread again. Will these stiches work with other thread? It would have to be pretty slippery. any suggestions? I know what you mean. I found if I washed my completed piece in HOT water with shampoo, I could get the piece clean but needed to set the colors. Adding vinegar to HOT water and letting it soak helped. I had to repeat a couple of times but it worked. Whatever you do, DO NOT use Oxi Clean type products. It is important to dry your piece. I roll it in a towel and stand on it to wick as much water as possible. Now pin it flat with no wrinkles or pucker and grab you blow dryer. I know this sounds complicated but it really is so easy. I have pillow tops I have to wash and it really is simple and you end up with such beautiful pieces to frame or make into a pillow or what ever. People that receive my pieces are truly thankful. Thank you so much for your very thorough info and efforts in collecting great examples of this beautiful embroidery technique! I love your blog and know when I see a pin from “Needle and Thread” that the info is reliable!! I’m looking for help in finishing a pillow that I started year’s ago.I live in Mary Esther Florida. I started doing Brazilian Embroidery about 30 years ago. I would spend hours upon hours happily stitching. Life will often throw a wrench your way and things are never the same. I lost my husband and had my children to raise. The wonderful woman, Edna Bagnariol, passed away and her shop closed. I lost my supplier for thread. My grand daughters each loved an original design of a unicorn surrounded by all these flowers. 2 girls one stitched picture. Time has been good with this technology so I found Edmar. They were wonderful trying to find a local supplier. No luck but I am so blessed. They will be at the Sewing and Stitch Expo March 2 thru 5, 2017 in Puyallup, WA. They will be about a mile or so from my home. Bet you can guess where I am going to be. Have since completed one piece, started 2 more and have designed 3 that I want to get done in the next 6 mo. I will be stitching so happily ,night and day. Want to enter some pieces in the Western Washington Fair in hopes of connecting with other stitchers. I used to stitch with a great group of ladies once a week. My night out. This brings me peace. You stitchers know what I mean. I have been looking for a supplier of the thread to do this embroidery. Next Next post: Wool Embroidery Project: The Leaves Go In. The Leaves Go Out.